Now that your practice calendar is created, it’s time to write workouts to assign to a practice. In TU Coaching Tools, practices are composed of one or more workouts, workouts are made up of one or more sets, and sets are made up of one or more swims. Two approaches to assigning workouts are building a workout from scratch within a practice or assigning a pre-created workout from your library or the Community Workout Library. Let’s begin by building a workout, then we will assign it to a practice. You can also write workouts in Web Coaching Tools. To begin building, tap > Coaching Tools > Workouts (also accessible via the WORKOUTS tab on a tablet at the top). Tap NEW W/O (phone) or CREATE NEW WORKOUT (tablet) in the upper right. This will open the ADD WORKOUT screen. The Alias will be an abbreviation of the Title. If you plan to reuse the workout, make the name something memorable. If you turn on Favorite, you can set a filter to display all workouts marked Favorite. 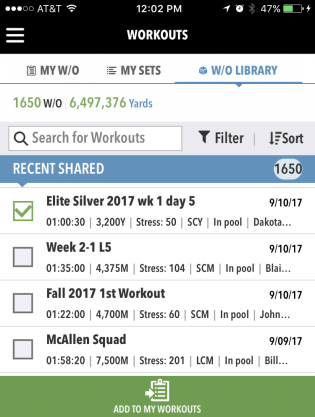 If you mark the workout as a Draft, no other coaches but you will be able to see it until you deselect it. Tap by Tags, then select one or more tags and tap Done. You can then set filters to find workouts by tags. Now you will build the workout by adding sets to it. You can either add brand new sets you create on the fly, or select from previously built existing sets. We will show you both ways. Note you can click SINGLE SWIM to add just one Swim to the workout; start at step 7 below if you do this. Tap ADD SET (phone) or ADD NEW SET (tablet). This will open the NEW SET (phone) or CREATE NEW SET (tablet) screen. By default, the Set will be saved to your Set Library. If you uncheck Export Set to My Set Library, it will create a one-time Set in this Workout only, and you will not need to give it a Set Name. Enter a Set Name. Again, replace the default name with a memorable name if you intend to reuse it in future workouts. Tap by Tags, then select one or more tags and tap Done. Favorite, for which you can set a filter (not available if Export Set to My Set Library is unchecked). Circuits, where you will enter the number of Reps for the entire Set. 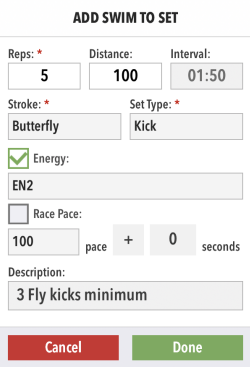 Test Set, which allows you to time and track all the swimmers who participate in it (not available if Export Set to My Set Library is unchecked). Test Sets show in red in the workout list. 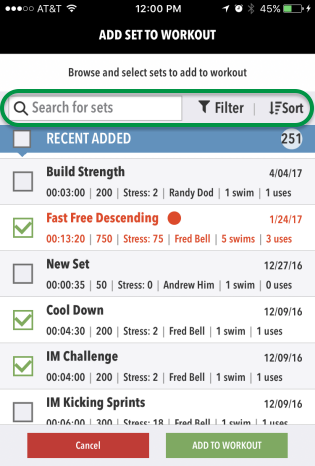 Tap SWIMS (phone) or ADD SWIMS (tablet). This will open the ADD SWIM TO SET screen. Fill in the fields (those with * are required). You will need to tap Done after entering data in some fields like Reps.
You can add your own custom Strokes, Set Types, and Descriptions in the web app. To enter a Race Pace, pick the desired pace, tap + to switch it to a - if you want to subtract seconds instead of add them, and enter the number of seconds to add or subtract if desired. Tap Done when finished and this will add the swim to the set. 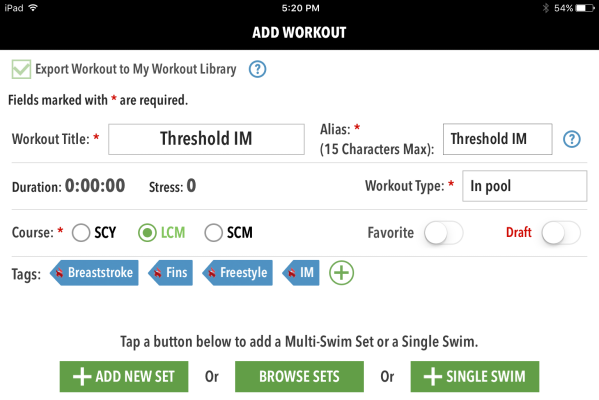 Beyond adding additional swims and rests, you can tap the swim you just added for more options. Then you can edit it, add another swim, add a rest time, clone it, or remove it. 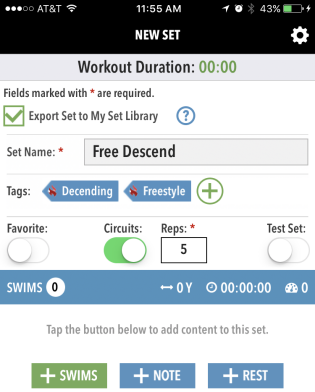 Tap CLONE, then tap the cloned swim and tap EDIT to quickly add a new swim that only needs minor changes. Long press on a swim, and then you can drag it anywhere in the list. 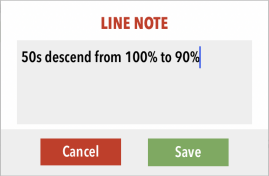 Tap NOTE (phone) or ADD NOTE (tablet) to add in-line notes between Swims. If you tap the Set you just added you will get a menu like when you tapped a Swim to EDIT, CLONE, etc. Just like you can create Swims variants, you can create Set variants. Best Practice: It’s typical when writing sets and workouts to build a new one every time. But since Coaching Tools stores them all, you can be more efficient by reusing existing ones. Our Reuse Sets to Quickly Build Workouts tutorial gives a good demonstration of this in action. Here you have three tools to quickly find sets: Search by typing a name, using Filters, and Sort By. You can use all of these techniques with your own set library. Once you find the one(s) you want, select them. Once you've selected all the ones you want, tap ADD TO WORKOUT. They will be added to your workout in the order you selected them. You can long press and drag to rearrange the sets in the workout. You can add rests between sets. 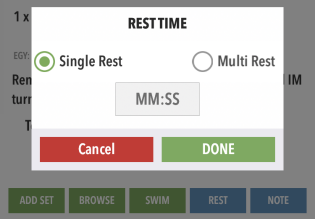 Tap REST, select Single Rest or Multi Rest to enter the same rest period in between all the sets, enter the rest time, tap DONE, and long press and drag the rest if needed to place it where you want among the sets. Tap NOTE to add in-line notes between Sets. Alternatively, tap SAVE & SHARE to share your new workout in the Community Workout Library for other MainSet users to benefit from. You can share up to 10 of your workouts (this limit keeps the library uncluttered). You can later tap UNSHARE to remove it from the library and make room. Need a workout fast? Want some inspiration? Grab a workout from the Community Workout Library. Tap > Coaching Tools > Workouts. Tap W/O LIBRARY (phone) or COMMUNITY WORKOUT LIBRARY (tablet). Use the Search Filters to narrow down what you’re looking for, then select one or more workouts and tap ADD TO MY WORKOUTS. You will then find what you selected in MY W/O (phone) or MY WORKOUTS (tablet) to edit and use as you please. You can import as many workouts as you like. The sets within the workout(s) will be in MY SETS. Note if you delete a workout you imported, the sets in it will still remain so you'll need to delete them as well if you don't want them anymore. You are now ready to add your workout to a practice.